So being almost 2 years old and a wild child at times, Chandler is still in his crib. I have no desire to put him into a bigger bed so that he can roam the apartment how and when he wants to. Plus he doesn't climb out of his crib. He's only tried once and he started screaming as the crib was pulled away from the wall and he was suspended by his neck. Yeah, that was scary. Now I make sure the crib is pushed right up against the wall. Anways, I like to take advantage of the fact that he sleeps in late and will usually shower while he's still sleeping. 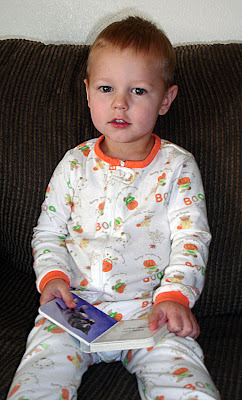 When he wakes up, he has some books and toys within reach that he plays with and reads. Then he will just holler until I come get him out. He also can't turn knobs yet and so if he shuts himself in his room, again, he will holler until someone comes to get him out. I believe it was Sunday, I got up about 9 - Chan usually wakes up about 9:30 and I found him wandering around the kitchen, standing by the closet pantry because he's hungry. Marshall is in the shower so I figure he got Chandler out of bed. Come to find out, Marshall says he didn't get him out of bed. Weird, right? So today I put my ear to his door to make sure he's still asleep and decide to get in the shower. I wasn't in the shower more than 10 minutes. I got out and noticed Chandler's door was open. I immediately felt nervous and ran into his room. Of course he wasn't there. 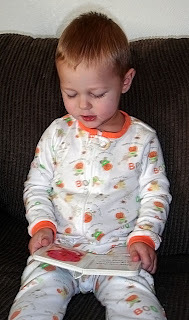 I run out into the living room and there he is, sitting on the couch, reading a book.....lol. I have no idea how he got out of his crib and opened the door to his room? Ok, so the crib climbing thing I can understand, but he can't open doors? I shut him in his room this afternoon to see if he could open it. I could tell he was trying, and he finally just started crying and I let him out. I don't get it? This reminds me of one other time he proved to be a magician. It was probably 3-4 months ago. I had put him in his chair (buckled in) with his sippy cup and put a movie on. I got in the shower and hadn't been in there more than 3 minutes when I felt a breeze. I panicked and thought someone was in our apartment. Then Chandler pulls back the shower curtain and starts tugging at his clothes because he wants to get in. I went to look at his high chair and the tray was still on, and it was still buckled. He's never done it since :) Guess I need to get up at like 7 am to take my showers from now on, lol. I just read your blog when Carson came into the room. I told him that Chandler is mysteriously escaping from his crib. Carson immediately started yelling, "Go Chandler! Go Chandler!" Maybe it is a conspiracy. Carson can open doors. What a funny kid. Things are going to get pretty interesting around there with a new baby and a magician! Creepy little guy, isn't he?! Haha - just kidding. Kids are amazing. Dean doesn't climb out of his crib yet (it is a black Emily DaVinci so I don't know if he will be able to) but he does bang his feet relentlessly against the sides - if he can't climb out, he'll BUST out! We may get him a big bed for Christmas at this rate, (we'll wait AT LEAST until then since he's only 16 months) he's ready for it though. Devin and I are not, however. We put Logan in a toddler bed around 22 months. It has the same kind of wood as his crib and he transitioned like it was nothing. For a couple months he would stay in his bed and wait for me to come get him out, but now he knows better and comes in my room in the morning to wake me up. We put those child-proof knobs on our doors but Logan just grabs them and turns them, I don't know how he does it. I know he can open doors, but sometimes when he is in his room he has a hard time and accidentally locks the door from the inside (I can just use my nail to open it). Maybe Chandler can open doors when you're not around, but when you're there he has a hard time? That's funny. Toddler beds aren't so scary. P.S. So every time I watch Private Practice (the spin-off of Grey's Anatomy) I think of you cuz I guess Addison looks like you to me. Anyone else think this? Hahaha.. that brings back memories of Kaden. It starts happening mysteriously then one day it is just part of their routine. It wouldn't suprise me if he is getting out on his own. Yay! another milestone Chandler! oh and no I don't think my sister looks like addison. :) I think Tiff is much prettier! A little Houdini. It is kind of freaky when you expect them to be somewhere and then all of a sudden the escape somehow. The crib thing seems so long ago. I can't remember how long we had Moura in a crib.